Not sure about stamping on metal? Well then, you should give stamping on leather. A bit less daunting. I had great fun stamping leather for this gilded bracelet tutorial before. 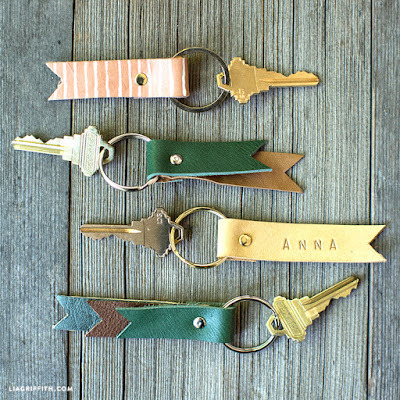 Check out this easy peasy stamped AND riveted leather key chain tutorial from Lia Griffith. This design also lets you practice riveting! Two in one tutorial! You can use any rivet you like but the compression rivets look best. See my past tutorial on compression rivets here. What a great personalized gift idea! Thanks. I was just thinking of trying stamping on leather. Will check these out. Hmmm - maybe it's me but I didn't find a link anywhere to the keychain tutorial. Is it me? Thanks Aims. My bad! Link now added!